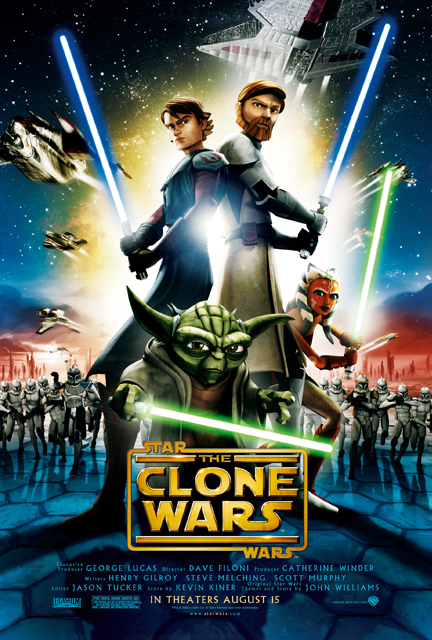 Join the Poops for week number two of #ShittyStarWarsMonth as they watch and discuss Dave Filoni's 2008 film STAR WARS: THE CLONE WARS! This week's movie was Dustin's pick. Dustin and Jessica really hated this movie! Like, a lot! Tune in for 100 minutes of complaining! If you want to support the show, be sure to visit Audible and sign up for a free 30-day trial of their audiobook subscription service. You will also receive a free audiobook that is yours to keep whether or not you decide to continue with Audible after your trial membership has expired. Please use the link provided so they know who sent you. You can also donate to our GoFundMe. Stick around after today's show for a few words from this week's Poo Pal, the Soiled Restroom Cinema podcast! Just to answer a question about Rebels: the lightsabers are skinny to look more like the Ralph McQuarrie concept art. As does Vader's weird elongated mask design and Zeb is the original McQuarrie design for a wookiee.